One of the most intriguing areas to watch this offseason will be the Eagles' maneuvering to find their 2013 quarterback. To that end, there's a clear month-by-month path that they have to undertake -- and it begins next week. February 6: If Michael Vick remains on the roster after this date, $3 million of his salary automatically becomes guaranteed. That makes the 6th the first important marker in the Eagles' decision-making process. Do they keep Vick, absorbing the contract hit because his athleticism may still be the best option for Chip Kelly's offense? That's unlikely. Vick still has great mobility and a rocket arm, but his decision-making, despite a few years of tutoring from Andy Reid and Marty Mornhinweg, is questionable. Moreover, even if you can keep Vick happy and teach him a new offense, the upside is limited. He still wants to start, but will turn 33 before training camp with significant wear and tear on his body. At best you're buying a stop gap option, and that doesn't seem worth the $3 million guarantee. Expect the Eagles to sever ties with Vick after the Super Bowl. March 12: Free agency begins. Unfortunately, there aren't many quarterbacks out there of note. Still, the Eagles should be dipping their toes into this pool if they let Vick walk. Players like Tarvaris Jackson, Matt Moore, and Jason Campbell are best suited to a backup role, but they might rather get a shot of competition in Philadelphia than automatically sit on the bench. Are you scraping the bottom of the barrel here? Sure. But every team needs depth and competition at the QB spot, and these options aren't going to be expensive. Maybe you get away without signing someone if you think Trent Edwards can adapt. 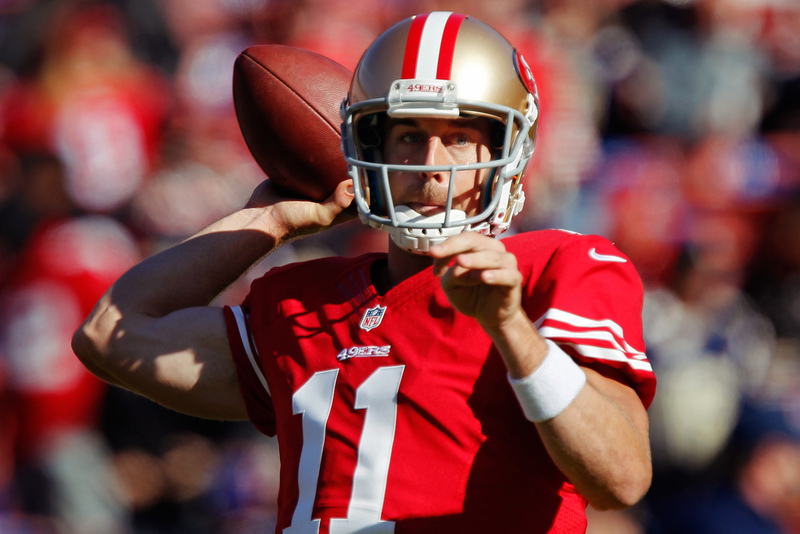 April 1: The only potential free agent who actually may be able to start is Alex Smith, currently under contract with the Super Bowl-bound 49ers. Smith, according to reports, has a contract clause that kicks in on April 1st that makes his entire $7.5 million salary guaranteed. San Francisco certainly isn't going to pay that, so they will look for suitors before having to cut him outright. The Smith case will be interesting to watch because of the multitude of factors at play. The 49ers have to trade him in the month of March, or else cut him. They have little leverage unless multiple bidders step up. The question is, who would bid highly for Smith? At first glance, there are seven teams who will be in the Franchise QB hunt this offseason: Buffalo, Cleveland, Jacksonville, Kansas City, Oakland, Philadelphia, and Arizona. Most of them are in rebuilding phases where buying a soon-to-be 29-year-old quarterback isn't on the agenda. Plus, John Harbaugh and the 49ers haven't exactly treated Smith like a franchise guy. They openly flirted with Peyton Manning, then benched Smith in the middle of his best season for an unproven second-year player. That doesn't seem like a quarterback in whom you want to invest. If I were the Eagles, I would part with a 2013 late round pick or a conditional selection in 2014 based on playing time for Smith. Certainly if the 49ers cut him, you have to investigate. He's no great quarterback, but competence and a dash of athleticism could still be valuable. April 25-27: The NFL draft. If the Eagles handled free agency properly, they should have Nick Foles and at least one other potential starter (or at worst, a fair backup) at this point. You never want to enter the draft with a glaring need, especially at quarterback, or other teams will use that knowledge to their advantage. Plus, you just can't count on getting the guy you want. Unfortunately, the Eagles (and other teams) are shackled with a poor class of quarterbacks. It's even poorer when you look for guys who could fit Chip Kelly's system. The order of all of these players is still being sorted out, but from what I've been reading, there are only a couple that really interest me. In the first round, Geno Smith out of West Virginia could be an option. No one thinks he's the second coming of RGIII, but he had a lengthy, productive college career throwing from the pocket and has some mobility to boot. Smith also seems likely to score highly on the Football Outsiders Lewin Forecast. Manuel is impressive on film and when discussing his game. He is not nearly as impressive when standing in a pocket and distributing passes in a stripped-down game plan. He has the size coaches covet (“He looks like a tight end out there,” Detroit Lions/South Squad coach Jim Schwartz said) but his best bet will be to follow the route of Wilson: earn a mid-round selection and find a coach amenable to his playing style -- perhaps Chip Kelly, who recruited Manuel out of high school and now coaches the Eagles. Sounds promising. The nice thing about Manuel is that he potentially fits Kelly's style, and also wouldn't cost a top pick. Consensus suggests he's more of a 3rd-5th round prospect (at least, before his Senior Bowl performance). At that low risk, I'd draft Manuel in a heartbeat. Let him compete for the job in an up-tempo spread offense like he's used to. If it works out, maybe you've caught something similar to Russel Wilson. If not, move on without any huge cost. July 22: Training camp will start sometime at the end of July. This is when the real competition begins between free agents, rookies, and the incumbent Foles. One note about Foles: I don't have anything against him, but he's essentially the fall back option here. He's cheap and has shown some skills. Don't hand him anything. Let Foles prove that he deserves to start -- and that he can compensate for his lack of running skills. April 24-26 (2014): I've discussed before how the best way to find a franchise quarterback is to keep throwing them at the wall until one sticks. The general outline of pairing Foles with a rookie and a veteran free agent seems like the best way to pursue that path this year. But the nice thing is that you're not wedded to anyone long term. If none of those options work this time, you start over again. Next year's draft could be loaded with talented, athletic quarterbacks like Logan Thomas, Tahj Boyd, Teddy Bridgewater, and Johnny Manziel. When at first you don't succeed: try, try again. Tagged with NFL Draft, Trade, Philadelphia Eagles, NFL, Alex Smith, EJ Manuel, Geno Smith, Nick Foles, Offseason, Chip Kelly, Free Agency, Michael Vick, Quarterback. January 28, 2013 by Brian Solomon.